What is the importance of a backflow prevention device, and if I have one is their any maintenance? Backflow devices prevent cross contamination. When installed they prevent water from flowing backwards and contaminating private & public water systems. Chances are if you’re inquiring about back flow prevention services you already know what they are and why they are beneficial. West Coast Plumbing & Water Treatment has the ability to install new, and/or replace existing backflow prevention devices for both commercial and residential applications. As well as has multiple technicians state licensed in certifying the backflow devices annually per the municipality requirements. The backflow of water from a home plumbing system into community drinking water happens when water is pulled backward due to a pressure loss in the utility main pipe or pushed back by a pressure source like a well pump. Backflow devices are mechanical plumbing devices installed in a plumbing system to prevent water from flowing backwards and contaminating the public water system. A properly tested and maintained backflow device can prevent the backflow of water of an unknown quality from back flowing into the community water system. 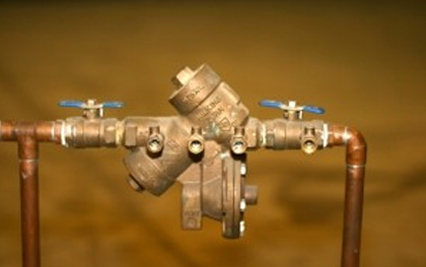 All commercial and residential backflow assemblies must be tested annually in order to comply with regulations and to meet city and state codes. West Coast Plumbing and Water Treatment will simplify all your backflow prevention needs; including testing, certification, and service. Currently we are licensed to test and certify backflow devices in SW Florida (Charlotte, Collier, Hendry and Lee Counties). Brian is licensed and certified in the State of Florida to provide backflow testing, and has the experience to manage all models of backflow prevention assemblies. Call our 24 hour service at 239-340-8224.